Um, Why Is There a Giant At Kim Jong-Il's Funeral? At first glance I thought this picture of yesterday's insane funeral procession must have been photoshopped, either by a mischievous Reddit user or North Korea itself. 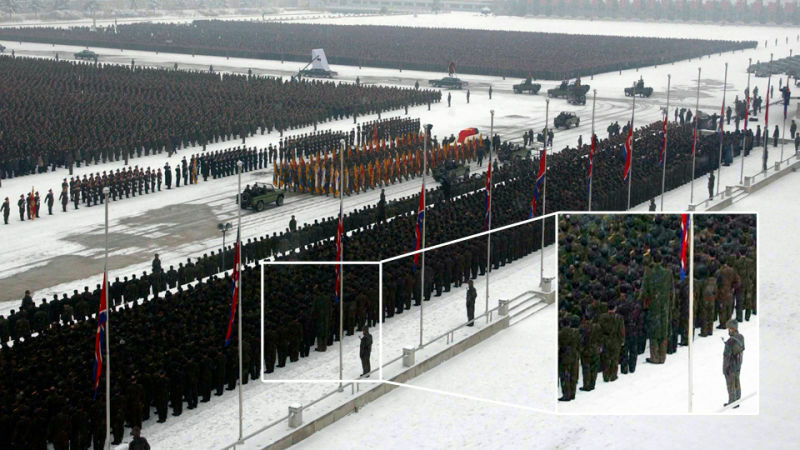 After all, North Korea was just caught erasing an unsightly camera crew from another picture of the procession. Maybe the propaganda people were bored and wanted to freak everyone out with a fake giant. But when I looked up the original photo released by the Associated Press, there the guy is towering over the crowd. He's real. Reddit users speculate that the man is 7' 9" North Korean celebrity giant Ri Myung Hung. Once named the tallest man in the world by the Guinness Book of World Records, Ri is North Korea's only internationally famous basketball player. He tried to play in the NBA in the late '90s, but was prohibited by the State Department, probably because they knew he'd destroy all our comparatively miniature American basketball players. Here's a short documentary about him. This seems more reasonable than my first guess: a short North Korean standing on another short North Korean's shoulders under a big trenchcoat.